Want to further customize the player theme? Take advantage of Cloudinary's automatic generation of adaptive bitrate streaming files to automatically adjust the resolution of your video in real time to best match the player dimensions, available bandwidth and CPU capacity of each viewer. simply define 'sourceTypes' to the desired format ('dash' or 'hls'). You can  define a desired profile using the 'transformation' param. You can register to video player events and then use these events to create custom video player controls or to trigger other custom behaviors in your application. In addition, the Video Player supports tracking events for analytics platforms such as Google Analytics. You can create a playlist based on a list of public IDs or for all videos in your Cloudinary account with a specified tag. After you have defined a playlist, you can use playlist methods to control the list. For example, you can jump to the next or previous video, jump to a specific video in the playlist by index, determine whether to show of preview of the upcoming video, whether to auto-advance to the next video when the previous one ends, and more. You can define recommended videos when setting a player's video source. The recommendations are shown as thumbnails in a recommendation overlay when the video ends. The primary recommendation includes the title, subtitle, and description of the recommended video (if defined). As shown in the playlist example. 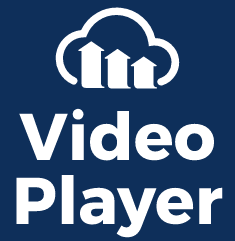 Cloudinary HTML5 video player ad capabilities allow you to monetize your content with ads. Our player is compliant with the leading ad standards: VAST, VPAID and VMAP, as well as ads that are managed with Google’s DoubleClick and AdSense. Use ad tags in your video player definition to activate a comprehensive set of advertising options, including banners and pre-, mid- and post-rolls (with or without skip option). providing the ad server URL.